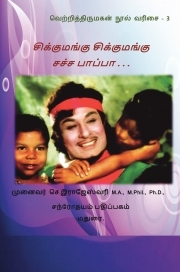 Description of "Chikku Mangu Chikku Mangu Chacha Paappa (சிக்கு மங்கு சிக்கு மங்கு சச்ச பாப்பா)"
MGR's love for children unfolds in this book titled "Chikku Mangu Chikku Mangu Chacha Paappa" and how his love for children made him an endearing icon among children and for generations to come. Dr Rajeswari Chellaiah has a Ph.D. in translation studies. She has published innumerable research papers on translation studies and has authored several books, most notably her work or multiple books on MGR have been widely received and acclaimed. Reviews of "Chikku Mangu Chikku Mangu Chacha Paappa (சிக்கு மங்கு சிக்கு மங்கு சச்ச பாப்பா)"